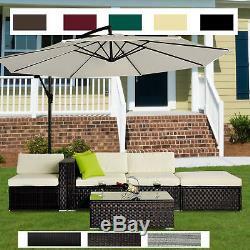 5pc Rattan Wicker Garden Furniture Sofa Set or 3m Garden Banana Hanging Parasol. 5pc Rattan Garden Furniture Set: Colour: Brown / Black Corner modular section: 75cm x 75cm x 64cm Middle modular section: 67cm x 75cm x 64cm Total Sofa: 217W x 64H x 75D cm Footstool: 75W x 30H x 75D cm Coffee Table: 90W x 33H x 50D cm with 5mm tempered glass top 7 piece back and base cushions 2 free 40 x 40 (cm) lime green scatter cushion 2 x Corner Modular sections 1 x Middle Modular section 1 x Footstool 1 x Coffee Table with 5mm tempered glass top 7 piece back and base cushions Custom label: 100110-015BN-C1 (Brown) / 100110-015BK-C1(Black) /. Color: Grey Composition: Galvanized steel Material Used: PE rattan, anti-flaming polyester cloth Other Colors: black, Green Middle Sofa Size: 75L x 67W x 64H cm 2 x Corner Sofa Size: 75L x 75W x 64H cm Stool Sofa Size: 75L x 75W x 33H cm Tea Table Size: 90L x 50W x 33H cm Pillow Size: 40 x 40cm Single Sofa Weight Capacity: 160kg Stool Sofa Weight Capacity: 160kg Tea Table Weight Capacity: 70kg Net Weight: 28kg, 20kg, 15.6kg Gross Weight: 30kg, 22kg, 17.8kg Flat Pack: YES Assembly Required: YES Number of Product Components: 5 Box Dimension: 74.5L x 70W x 39H cm; 92L x 78W x 24H cm; 77L x 66W x 36H cm. Custom label: 860-017GY-C1(Grey) 3m Garden Banana Hanging Parasol: Colour: Black, Beige, Green, Wine Red, Coffee Metal rib: 12 x 18 x 0.45 (mm) ellipse cannulation Metal radian pole: 42 x 0.9 (mm) Metal stand pole: 48 x 0.9 (mm) / 53 x 1.0 (mm) Cross base frame: 10W x 1.0 (mm) Net weight: 12kg Package size: 194 x 31 x 14 (cm) Note: 01-0218 / 01-0584 / 01-0585 is symetrical 01-0217 / 01-0219 is not symetrical Custom label: 01-0217-C(Black) / 01-0218-C(Beige) / 01-0219-C(Green) / 01-0584-C(Wine Red) / 01-0585-C(Coffee). Self-combination: please select your favourite colours and products. Banana parasol is a good match for Rattan furniture set! 5pc Rattan Garden Furniture Set: Our Rattan set is made from durable fully weatherproof PE rattan which is perfect for indoor and outdoor use. Metal frame can be left outside all year round in all weather conditions. The rattan set offers total flexibility and can be easily moved to suit any occasion, this set really is an all rounder, looking at home in any garden, conservatory or sun room. Leveling feet adjust to help raise or lower the set as you see fit. 5 piece outdoor rattan furniture waterproof Rattan material, will not fade Back and base cushion: removable covers; 8cm thickness sponge filled Comes with two extra free lime green scatter cushions All cushions covers are removable and machine washable Included: 2 x Corner Modular sections 1 x Middle Modular section 1 x Footstool 1 x Coffee Table w/5mm tempered glass top 7 piece back and base cushions 2 free 40cmx40cm lime green scatter cushion. 3m Garden Banana Hanging Parasol: Be aware that the actual colour of the item may be slightly different as shown on the above photos due to the screen resolution matter. Please note: The round parasol base that placed on the cross-shaped parasol base in the picture is just for helping to Keep Balance, it is not included in the package. We recommend the cross-shaped parasol base to be used with paving slabs. Stylish banana hanging umbrella, superior in material and excellent in workmanship. Combined traditional workmanship with modern aesthetics, unique and utility This fascinating parasol is easy to match any villa, garden, courtyard, swimming pool, plaza etc It is also an amazing addition for your rattan furniture or outdoor dinner table High quality cream white 180g/m2 terylene fabrics and included top vents The frame is made from iron black powder coated for maximum protection Crank winding mechanism to open and close your parasol Lift slider to extend your parasol outwards 8 umbrella ribs support the canopy Cross-shaped umbrella base which need to be used with paving slabs (paving slab not included) Diameter 3m hanging garden parasol hangs over your dining set or garden set Perfect use for basking and enjoying sun shining Ideal for covering spas and breakfast in garden and such relaxing leisure. MH STAR verifiably manages retail globally with branches in US, Canada, Germany, Spain, Italy and France, we now welcome you to benefit from our prices in the UK. If you change your mind and wish to return the unused items to us, it must be done so within 30 days of the item being delivered. However, if you have any issues in regard to your order, we have a dedicated UK based customer service centre who will be delighted to help and resolve any issues that may arise. My item has reached me damaged/faulty/missing parts, what should I do now? To ensure quick resolution, please attach/include photos and part numbers and ask you to provide this information on first contact. This can be done using the attach photos tab located underneath the message box. We aim to respond to all emails within 24 hours and will do all we can to resolve any issues as efficiently as possible. I have changed my mind; can I cancel my order? Please note: If the goods are accepted/signed for, we will not be liable for the return costs. Can I collect my order? We do not offer customer collection as we operate from multiple storage facilities across nation that do not allow public access. You can also benefit from free collection at your nearest Argos by ensuring to choose this option at checkout. When will I receive my order? Are you able to deliver outside of the UK? I have ordered more than one item, will they be delivered together? The products might be originating from various stockrooms or conveyed with various dispatches relegations. How do I track my Item? Once dispatched, your consignment can be tracked (if tracking is available) online via the courier website. I would like my parcel to be left in a secure location, can this be done? I need a VAT Invoice, can this be provided? The item "5pc Rattan Wicker Garden Furniture Sofa Set or 3m Garden Banana Hanging Parasol" is in sale since Wednesday, February 15, 2017. This item is in the category "Garden & Patio\Garden & Patio Furniture\Garden & Patio Furniture Sets". The seller is "2011homcom" and is located in London.